Starbucks VIA Ready Brew instant coffee. Instant coffee makes me sad. This is not a judgment on its flavor. It is because, in my personal experience, the drinking of instant coffee is a surefire indicator that the circumstances of my life have gone badly wrong. It is the taste of a grimy breakroom at a dead-end job. The grudging cup offered by a non-coffee-drinker during an unhappy visit. The weekend I spent in a dingy Iowa motel when my car broke down the first day I arrived in town for a newspaper internship. Could instant coffee make me happy? This is the promise held out by Via, the instant  sorry, "100% Natural Instant & Microground"  coffee just launched by Starbucks, which it promises tastes just like a fresh-brewed cup of its own java. I went to my local Sbux and bought a pack each of Italian (dark roast) and Colombia (medium) Via. I also bought a cup of the daily dark roast, Sumatra, black, for comparison, as well as a couple of croissants and some vanilla-bean scones, as accompaniments and because TIME was paying. I also picked up a jar of Folgers crystals from the corner deli, whipped up a pot of homemade coffee (Guatemala, from Costco) and put on a pot of filtered NYC tap water. 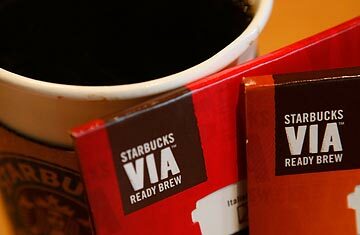 According to Starbucks, the difference in Via instant is that, in addition to dehydrating a brewed reduction of coffee, it adds microground beans to add flavor and body to the finished product. It's meant to taste more like the cup you'd buy  and at $2.95 a three-pack, it had better. (My Folgers was $5.99 for a 60-cup jar, even at the usurious prices of a Brooklyn bodega.) The resulting coffee dust (more like espresso than the usual crystals) comes packaged in a sort of coffee Pixie Stix, premeasured. The verdict? Via does actually taste something like brewed coffee. Not a great cup of brewed coffee, and not the coffee from Starbucks: my store-bought cup had a richer, winier mouthfeel, as does my Costco homebrew. At the recommended eight-ounce dose of water, the Italian tasted a little weak, but smooth. To my surprise, the Colombian actually had a rounder, more satisfying flavor, though I usually prefer a darker roast. (Both types of Via tasted better when the water had a minute to cool.) I wouldn't replace my home-brewed with it, but if my sister-in-law served it to me, it would not strain family relations; it might have made a suspect motel in Davenport, Iowa, slightly less depressing. I'm finishing the Colombian as I type this. Maybe I was just remembering the flavor of old-fashioned instant coffee wrong? Nope. I took a sip of the Folgers  oh, sweet Jesus, it was worse than I remembered: like an evil madeleine, tasting of ground plastic and pencil leads and unwise life choices. Nonetheless, I can't say I entirely get the point of Via as a product. I'm hard up thinking of many situations in which I would have long-term access to hot water and a buck a cup to spend on instant, yet would not simply go out and buy a French press. But clearly they exist. Myself, I'll soon be doing a home renovation that will leave me without a kitchen for several days, and I'm putting away my remaining Via for then. I still won't be happy, of course. But at least it won't be the coffee's fault. Read "Latte with Fries? McDonald's Takes Aim at Starbucks."